Native American Wildlife is the motif of this popular classic that has now been transitioned into its online iteration. With this particular theme, you would expect to see the spirited animals that populated the Western Plains of the Americas alongside the American Indian, such as the soaring eagle, the coy coyote, the bold and bodacious buffalo, easy-going elk and many other animals and artifacts used and relied upon by the Spartan and nomadic Indians.All these are prominently featured in the Eagle Bucks slots game. Just as the American Indians were not fancy and frivolous in their mannerisms or culture, this game, while not basic, is mostly utilitarian without a lot of complicated calculations and unlimited Bonus Spins, etc. The graphics are okay, but they could be upgraded to 3D and the muted colors could use a touch of vibrancy, some color balancing and sharpening to bring it into the 2,000s. The soundtrack is clear, bold and dynamic and is not adorned by unnecessarily violin flourishes and the like. Just plain, down to earth, solid and rugged. Perhaps the single exception to all this is when the magnificent Eagle arrives after each big win. There is nothing mundane about its presence or appearance. You know you are dealing with animal royalty. Someone threw in a sampling of the instrumental Dueling Banjosby Arthur “Guitar Boogie” Smith that was the theme song to Burt Reynold’s 1972 hit movie “Deliverance” either as a joke or out of musical ignorance. Either way, it’s awkward and out of place in this theme. Most of the animals, including the awesome Eagle, appear in a portrait frame, which makes them feel distant and static instead of vibrant as if they are alive and thriving on the wide open plains of Big Sky country. Non-animate articles are an eagle’s Nest with three golden eggs, Window Rock, and the overly used poker cards emblems. As stated earlier, this game does not come with a lot of frills. The single exception to that rule is the game starts with a Bonus Game that consists of 10 free spins. It also has some stacked Wilds that simply get you off to a winning beginning. And that’s it. You will rarely see any more Bonus Rounds. 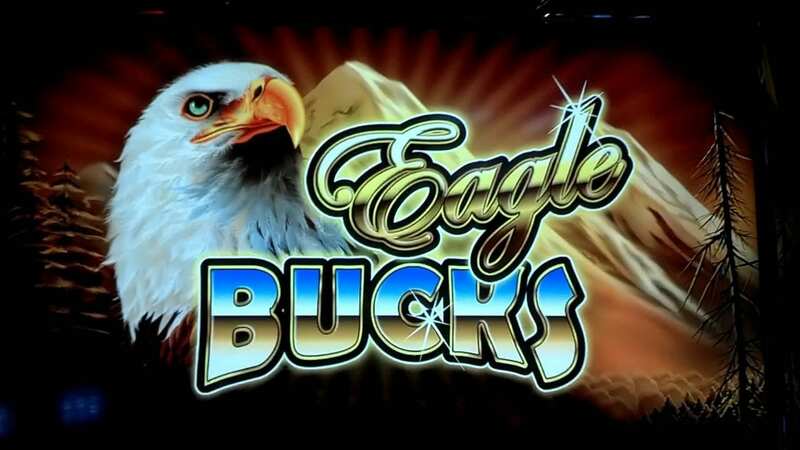 The betting range of Eagle Bucks is fairly broad and stretches from a mere one cent up to 250 NZD (coins). You can bet any amount within this range on any payline. The game’s win lines are 20, 10 and 1. It’s a good idea to play all 20 paylines every time as this increases your chances to win consistently. Remember, you can bet as little as one cent up to the 250 coins in any combination you prefer on each line as you see fit. Free Spins are selected at random, and there are two types. One is when the Eagle occupies all five reels on Row Five with Wild symbols. When the Eagle lands on rows four, three and two they morph to encompass the complete row. This enhances your chance of accumulating larger wins and makes up for the fact that this game does not include many bells and whistles found in more modern slots games. Payouts are all based on a minimum of threes, so there will be none for two of a kind symbols on a payline. If your winning streak is in tune with the animal spirits around you, you can activate the Bonus Round up to 5 additional spins by lining up three or more shields during the initial Bonus Spins. I would play this game, but to be honest, I don’t think I would play it a second time. There’s just not that much to keep me coming back for more. The only good thing is that it has great potential as a super popular game if Ainsworth Gaming decided to invest in a serious upgrade and modernize its virtual hardware and graphics as well as its software and algorithms, and of course, get rid of the anachronistic Dueling Banjos tune. Ainsworth Gaming has the opportunity to accomplish something that will do the American Indians proud. And don’t forget, many Indian Tribes have their own legal gambling casinos on their reservations (strike that) homelands. Ainsworth should take the advice of a legend named Pocahontas and learn to paint with all the Colors of the Wind. Could be a win-win situation financially for both cultures.